Mark Richt has lost control of Montana. Man, Stewart Mandel ($$) brings the shade. Also, Kirby Smart seems unlikely to let the Dawgs take their foot off the gas for even a minute despite them having already clinched the East. You’re not in the Mark Richt era anymore. I’ve got to give Stewart credit for that response to the question about whether the PAC 12 South is “deep or mediocre”? Deeply, deeply mediocre. Lmao. Richt was great at re-focusing the team after a loss. 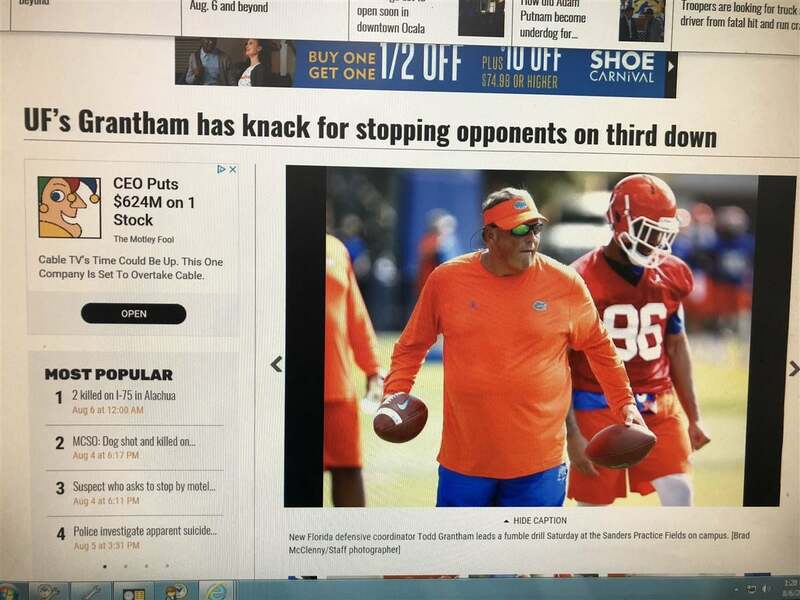 His record against Auburn was so good because his record against UF was so bad. Handling success week to week? Not so much. His son as QB coach while they seem to be regressing in QB play is not a good look at all. I wonder what his staff thinks about Richt Jr.
Yeah, that’s not working well and we know what Richt is not going to do. Strange, I remember hearing how UGA fans were unreasonable and how embarrassing it would be to fire such a good man. Their OL coach is Stacy Searles, the same guy that coached our OL from 2007-2010. Our offense deteriorated from then until he was replaced by Will Friend after Searles left for the Texas job. I assume Mark is working with Jon to coach the QBs and was always a good QB coach. I have not watched any of their games this year, but I wonder how much of the poor QB play is due to poor OL play. Throwing shade? Maybe. The truth? Fo sho and I love it! Your handle sure does check out. I don’t understand why any dawg fan would celebrate Richt’s struggles with such glee, but whatever. Every program has that % that is unable to appreciate a former coaches contribution to the program. I’d say that saltiness stems from hatred for the man. I don’t take any delight in Richt struggling. I think we’re all cheering for him Sat night. I think he would have been a great coach in the 90’s but the game changed on him. Something similar happened to Dooley but he knew when it was time to step down and went out on a high note. I’ve never understood the love for Dooley. I think he was very overrated. Take away Hershel and 1980, 81, 82 and 83 and you have a very average coach with not much to brag about and no national championship. Richt was more consistent, but never got lucky enough to win it all. If the playoff existed during his years in Athens, he would have made the playoff at least once (2002) and maybe 2 other times (2007, 2012) and maybe would have won a natty. I do think Dooley DID know when it was time to hang it up though, but 25 years is a lifetime for a college football head coach. Make the playoff with 2 losses? I don’t think so. Especially since 3 of the 4 losses those 2 years were bad, bad losses. Losing to AU 40-17 was not a good loss last year, but we did make it….with 1 loss. BUT Auburn was supposed to be “in” last year if they beat us in the SECCG with 2 loses. I guess it depends on if there are any good wins (#1 UGA and #1 Bama) on the resume to overcome the 2 loses. Of course, I’ll be the first to admit that Dooley at least DID win with his once in a generation player (Hershel) and get his natty. Richt had several incredible players and couldn’t either keep them out of trouble (suspensions) or win as much with them as he should have (Gurley, Chubb, Michel, A.J. Green, Stafford, etc.). I take no pleasure in his current status at Miami either and wish him the best as I was also against his dismissal at the time, but as hindsight is 20/20, I can now see that it was time for him to go at UGA and am VERY satisfied with Kirby! Those are non-Herschel years were Dooley either won the SEC or had a highly ranked team (1975 no so much though) . TXBaller was doing the opposite of what you were thinking. Because Dooley (and Eaves) essentially built the modern Georgia program. He inherited a program that had done next to nothing in about 16 years and was lagging behind Tech. He turned that around immediately and stabilized the program at a good, and occasionally great, level for 25 years. Yeah, but what has he done for us lately? No love for GT at all, but I think they beat Miami Saturday.. It could happen. But Richt has never lost at Tech. And is 15-2 against them overall. I wouldn’t bet against Miami in this one. Don’t kid yourself. There are several “fans” here that would pull for the nerds against any team Richt coaches. This might seem like a zinger if I hadn’t heard every single one of my Dawg friends say the same thing… and I’ve said it myself, as well. Richt teams were famous for laying eggs when it was least explicable and also failing to finish games his team thought were already won (such as the 2014 Georgia Tech game which was the nail in his coffin for many if not most Dawg fans out there). They were both all over Richt in the latest Audible Podcast. Didn’t we have the East clinched last year when we went to Auburn? Maybe our foot just slipped off the pedal in that embarrassment.